Is this the first project you’ve worked on together? Directors Alex Parkinson (left) and Richard da Costa. ALEX: Yes, but we’ve known each other for some time. We first met when I was making a film about people living as pigs, for which Richard was living in a pigsty. A few years later he told me the story on which Last Breath is based. He’d been working on oil-industry safety films, and had heard it in a bar from this sat diver. RICHARD: My jaw was on the floor the whole evening, and I said we have to make a film about this. There had been approaches to the dive company before, but because of some misreporting it had been keen not to get too involved. But I struck up a relationship with this diver and he put me in touch. We watched an industry film looking specifically at the incident, and thought it was such a great story there had to be interest, and we’d like to take it to a wider audience, on a much, much bigger scale. ALEX: The industry film was astonishing to watch and I thought my god, it’s got feature-doc written all over it. Such an incredible story, amazing characters, and the archive video was jaw-dropping. From there on we got together to work it up. 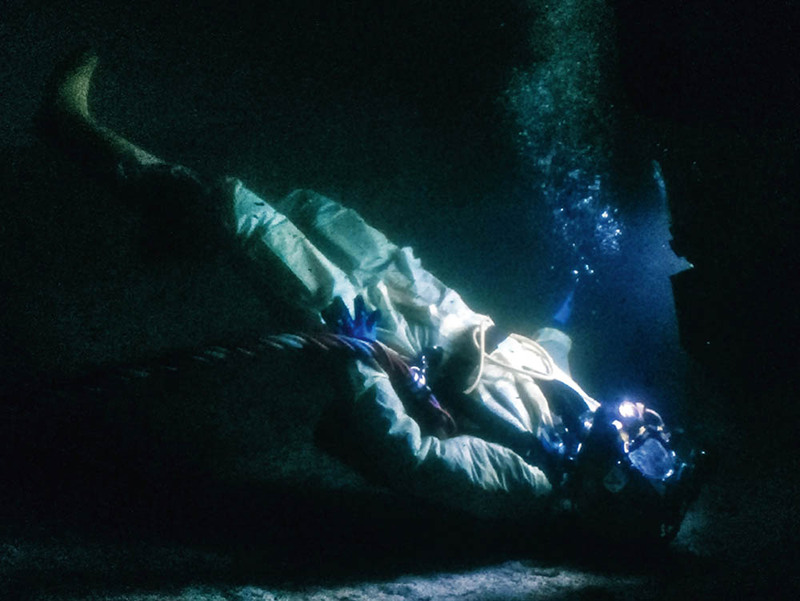 You don’t need to be a diver or know much about diving at all to engage with the story and the utter horror of being trapped all alone on the seabed. So that was what drove us eventually to get it made into a feature film for a worldwide audience. ALEX: Yes, that was what engaged me. Richard knew about diving from his industry work – I had my PADI certification but knew nothing about commercial diving. The pod scenes are like the International Space Station, it’s an alien world. RICHARD: I don’t think people outside the diving community have any concept of just how extreme that environment is. The pressure difference at which these men were working is 10 times greater than at the surface and the way they live is incredible, even without anything going wrong. You’ve already got drama intrinsically within the environment. All the ingredients are there. ALEX: The industry itself is intriguing, and that’s what the first part of the film is about. For an outsider it’s extremely exciting and also quite fear-inducing – I admire the people who do it but I wouldn’t want to be locked into a pod that size for a month, going down to the seabed for eight hours at a time in the pitch-black. 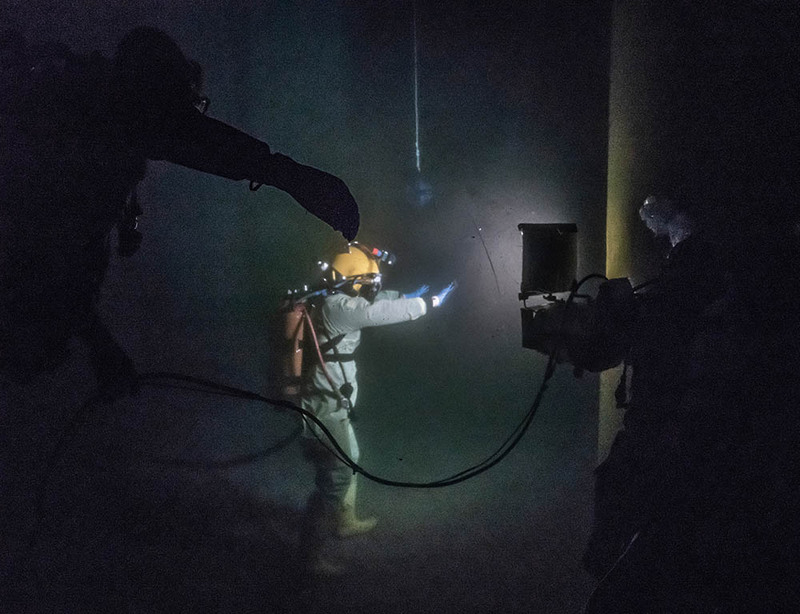 Had the story been reported outside the commercial diving community? RICHARD: When it first happened one of the papers carried a report and there were lots of factual inaccuracies. There was a picture of a fishing-boat that was supposed to be the DSV, for example. We wanted to make the film accessible to a wider audience but also as authentic as possible. Among the understandable anxieties of anyone involved in the story would be: ‘Am I going to be represented properly or are things going to be Hollywoodised or cheapened?’, so we were really keen not to do that. I hope we’ve achieved that – certainly the response of the divers has been that they think it’s as close as you can get. ALEX: They’d be the first people to say whether it’s accurate or not, and their response was overwhelmingly positive. Did everyone agree to take part? ALEX: Everyone took part. The story as told is unique in a way for a film-maker, because you’ve got all these people in very distinctive areas on the ship and in the water. They took a bit of convincing, because obviously it’s a big step to go from being in a film that’s shown only to your peers to then opening it up for everyone, so we spent a lot of time talking them through the process. Because we were so keen to keep it authentic, and because so few people understand what commercial divers do for a living, they were totally up for it when they understood what we were trying to do. Sometimes even their own families don’t understand the nitty-gritty of what they do. They know they disappear for months at a time offshore, but it’s so everyday for the divers that they don’t think to tell their families about it. I think they were really excited by the idea of showing their families what they do, and that was a big component of why they took part. RICHARD: The film would be nothing without the people in it and they’re all very different characters, but what they had in common was that they were totally straight with us, told their stories and were very honest about their emotions, their roles in the incident and what they thought and felt as things went along. I think the power of that really comes through in their story-telling. Divers are a unique breed anyway, and they played really well off each other in their interviews, which was a gift for us. The divers appear phlegmatic by nature, so when emotion gets the better of them, it’s quite moving. RICHARD: It’s a very male environment and you would expect it to be a very macho environment. The’re tough guys, but they’re also very caring guys because they live in such close proximity. Because they have to endure the extremes of their environment they look after each other, and it struck us very early on that it was a sort of microcosm of a family unit. I’m very pleased if we’ve managed to get across that these are feeling guys who really care about what they do and, most of all, about each other. Was it difficult getting the film green-lit? ALEX: It was quite a long process. Because we were making it as a feature-doc rather than for broadcast it took about three years to get it financed, though that’s quite a short time in the grand scheme of things. It normally takes seven to eight years! RICHARD: The difficulty is always getting meetings with people, and we probably had 60 meetings one way or another. But once people had heard the story they wanted to talk about it. We had the commercial interest all the way through, but it was a question of getting the right package with the right people in place. From getting the go-ahead it took one year before we picked up the first camera in November 2016. Did you encounter any problems while filming? RICHARD: Transport vessels aren’t cheap and we were very much relying on the support of the dive company, but we had to work around its schedules, which are very dependent on weather and job-finishing times. Alex and I had to spend quite a lot of time hanging around Aberdeen harbour waiting for a ship. 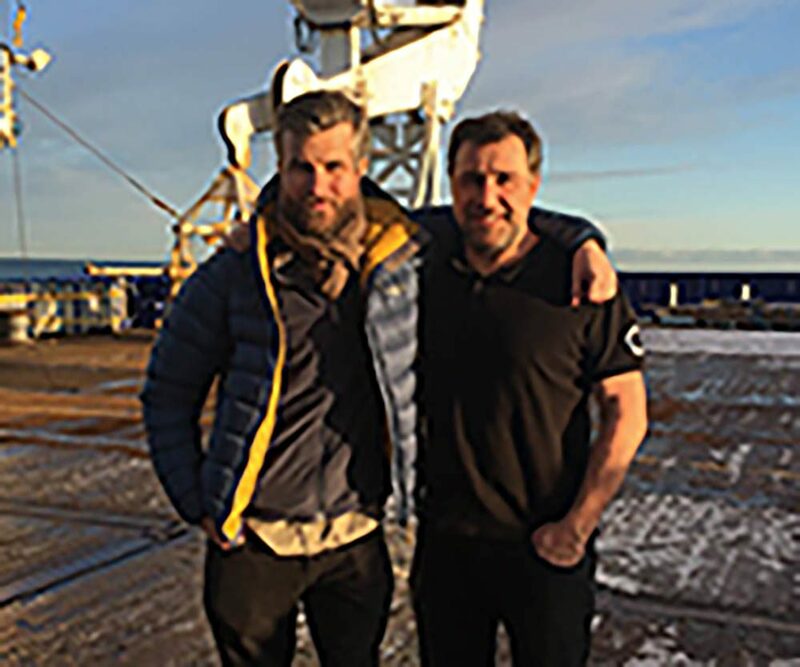 That was a challenge, because then it was difficult for us to book our crew, so Alex decided it would be best for him to shoot a lot of the offshore stuff himself rather than relying on crew. It turned out to be a really good way of working, far more flexible. Other challenges were the big setpieces like the underwater shoot, reconstructing the bell and so on. ALEX: It was about finding the right location. It took a while but we shot it up at Fort William [at the now-closed Underwater Centre]. The water in the tank was about 4m deep, so it was quite a challenge to make it look as if it was 100m under water, get the camera angles right and not catch the surface. Erik, a Swedish guy at the centre, did an amazing job on that – I’d totally buy into being at the bottom of the sea there. RICHARD: We had the choice between going to a dive facility and an underwater studio and it made much more sense to go somewhere where we had the dive expertise. The guys at the Underwater Centre were 100% on top of their stuff and totally supportive. ALEX: Then the National Hyperbaric Centre just outside Aberdeen was a real gift for us because it has that sort of bell set-up there. It’s slightly bigger, because there’s no way we could have shot what we did inside a normal-sized bell. RICHARD: In the run-up we also consulted quite a lot on the science side of things with DDRC, and they gave us quite a lot of advice because they were trying to get to the bottom of what actually happened during the incident. It was very helpful having all that background knowledge when we came to shoot the underwater section. 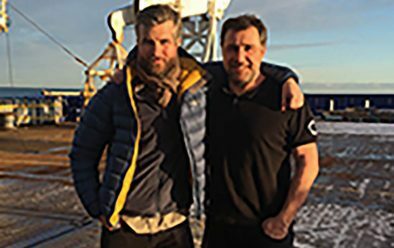 ALEX: It was also a joy shooting on the actual ship this all happened on, because all but one of the people seen in shot are the actual people or their equivalents, so the action you see happening is totally authentic – which is very unusual. ALEX: Paul [Leonard-Morgan} was superb; he did an amazing job on the score. We had a temp score on the edit, and he just took what we’d put down and elevated it to a whole new level where it had this cohesion about it and is just so powerful. It was a frantic rush to get it done, too, but he did it in four weeks, an incredibly short time to write a whole score and get it recorded.